A-skips x 2 --- Walking lunges with knee drive in A position, and coming up onto toes. Focus on balance, stabilisation and arm action. 10 yards each zone, working to maximal speed in final zone, with 6 yards deceleration zone. Acceleration - Players in pairs - Player 2 holding ball 5 yards away, when player 2 drops ball from shoulder height and commands go, player 1 must catch ball before it bounces twice. 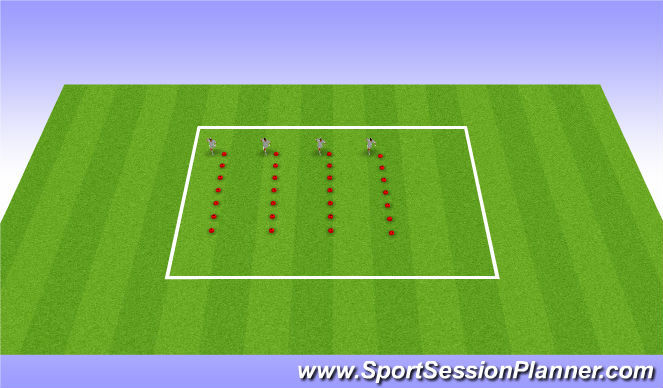 Players go through 5x, trying to go as far as they can, placing cone for furthest distance achieved. Swap ovr. Players do 2 sets of 5 each.